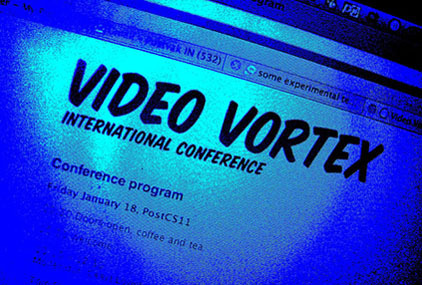 Video and Audio Documentation for the Video Vortex Conference in Amsterdam, in which I have been involved, is now available HERE. All presentations can be watched as flash video and listened to in your web browser or downloaded as mp3. A reader is being prepared. In the meantime, Stefaan Decostere, who was, for me, one of the most interesting speakers at this conference, premiered his installation WARUM 2.0 during the Artefact festival in STUK, Leuven (Belgium). A fascinating piece of work, that is, in a sense, a cumulation of his work as a filmmaker (for the Flemish public broadcaster) as well as the explorations with the (now defunct) CARGO platform, a context in which he investigated the effects of new technologies on the ways we deal with and create with media. It is clear that, as a mediamaker and -philosopher, Decostere is constantly looking for ways to intensify, involve and capacitate the ‘user’. ‘Use’, that is, after all, what new media are about : discovering and proposing new uses, and with that, introducing experiment and development into the existing media practice, subverting standard (industrial pushed) protocol, connecting media to the here and now. WARUM 2.0, as well, is essentially an attempt to create an intermediary space, consisting of set of tools that can be used to engage with, or if you will, against media. With WARUM 2.0 Decostere “revisited” ‘Warum wir Männer die Technik so lieben’ (1985), in which he investigated how war, speed and technology organise and reorganise reality, in collaboration with the American painter Jack Goldstein, French urban architect Paul Virilio and German video artist Klaus vom Bruch. A new interview with Virilio is at the heart of the WARUM 2.0 installation – or better call it “labyrinth” or “playfield”, an “arena of struggle”. Whereas the original documentary was a lineair narrative, although complex and multidimensional in its structure, this work wants to leave narration and interpretation in the hands and minds of the active user. Whereas the documentary was originally made for and shown on analogue television screens, here these has been replaced by projections, flatscreens and interactive modules, multiplied and spread over space. As Decostere writes: “The squared screens do not any longer function as windows neither, as their views create more blindness than clarity (…) If narration is still possible, it will have to be invented by the viewers. And where could it come from, if not out of their experience, as walkers in the dark or as searchers online. Unless something happens, there will be no great story to tell. So then, waiting for the event, in the cave? Or will you visitors call it a labyrinth, a playfield, a studio, a mess (hopefully not a mass. Please)”. “A pen, candle and paper are not sufficient any longer. We need to enlarge and equip our working table. Neither an internet connection nor some hard & software are sufficient any longer. We need more of this, as well as a solid network of kindred spirits deeply involved, technically that is, and in content (critically I mean), and engaged somehow, actively that is local, and thinking broad”. Warum 2.0 is now on the move, in search for its next possible destination….